In a world where technology is becoming increasingly important, and technological possibilities increasingly advanced, it is necessary and helpful to consider how and to what effect technology may be put to best use. In recent decades both hardware and software technologies have been implemented in the workplace to make lives easier, work more efficient, and standard of production higher. From typewriters to touchscreens, letters to emails, technological advancements have redefined understandings of what an office should be and how it should function. Based on ideas forwarded by Interactive Space, a professional services company in London, we explore the possibilities of the future: how might technology enhance office design in years to come? that everything one needs to work effectively is at the touch of a button. Of course, this has been facilitated by the development of technology in itself: the Internet, the cloud and email, make it possible to work on the go. It is probable that workplaces will develop in line with this technological trend: entire offices will be smartphone-friendly. Smart devices will open doors, QR codes will be used for meeting invitations, and smart payment solutions will be implemented in staff canteens. Instant messaging systems – such as Slack – are already being used in offices and are accessible from mobile phones, meaning workers are instantly reachable. 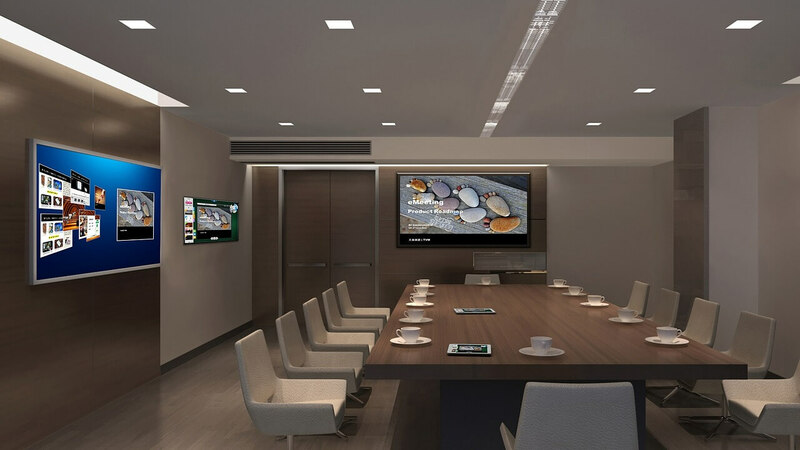 Office designs of the future will integrate smart walls for collaborative tasks and presentations. Smart walls will bring companies together, from in-house activities to client meetings, and external collaborations. They will facilitate wireless presenting and will act like an innovative dry-erase board, with an app that lets employees save and share content. Smart Walls will improve the ability to record, stream and distribute videos. Doodle, plan, present, view, review, meet and exchange. Rear projection screens will also be used to enhance digital signage and branding, while live data feeds will improve professionalism and performance. Glass projection walls will also be put to use in most offices. In office designs of the future, workstations will look very different indeed. In part due to an increase in the desire for flexibility in the workplace. It is thought that 92% of millennials consider flexibility as a top consideration when seeking a new job. As many as 58% of workers envisage workstations, as we know them, ceasing to exist. Instead, employees will have a variety of working options. Seating areas and work surfaces will be varied to suit particular needs; different areas will cater for group collaboration, individual work, meetings and presentations. Workstations will be integrated with enhanced technologies, creating smart workstations that streamline efficiency and quality. Portable devices will sync with desks, computers and centralised communication systems. Computer screens will increase in size; it has been found that dual screens or larger visual displays increase productivity levels by up to 15%. Entire buildings will become smart. Smart rooms will optimise the conditions of work, with the perfect lighting levels and temperature being controlled from a central console. It will be possible to monitor energy usage, air circulation and security from central systems in smart buildings. Space analysis will be mechanised to increase performance and productivity. Corporate apps will integrate with the technology of a building to direct visitors to their location, and check identity for safety purposes. Office spaces will see the unification of IT and audio-visual systems, with the aim of improving work output. Currently, technology is facilitating the transformation of offices, with spaces defined by the technological systems that exist within it. Flexibility, mobility and collaboration will characterise the focus of office design, with a marked interest in the technologies that will enable each. Fantastic goods from you, man. I’ve understand your stuff previous to and you are just too wonderful. I actually like what you have acquired here, certainly like what you’re stating and the way in which you say it. You make it entertaining and you still take care of to keep it sensible. I cant wait to read far more from you. This is actually a great website. Hello there, You’ve done a fantastic job. I’ll certainly digg it and in my view suggest to my friends. I’m sure they will be benefited from this web site. Youre so cool! I dont suppose Ive learn anything like this before. So nice to seek out any individual with some original thoughts on this subject. realy thank you for beginning this up. this web site is something that is needed on the net, somebody with somewhat originality. useful job for bringing something new to the internet! How to Deter Burglars and Make Your Home Safer?